Despite the various views on voluntourism around the world (mostly in the West) and potential problems (especially considering orphanage voluntourism) raised by many, the heat around it has never been seriously challenged. Chinese short-term international voluntourism has gained its popularity among Chinese volunteers in the last decade, with orphanage volunteering programs as one of its most demanded type of programs. 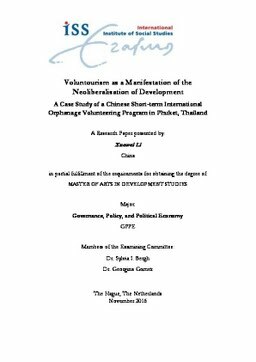 This research is aimed at understanding what are the underlying dynamics that contribute to the constant demand of Chinese short-term international orphanage volunteering programs through the ways it was portrayed by the main actors involved: Chinese sending organizations, Chinese volunteers, and host communities. Ethnography was adopted in a combination with covert participant observation (in a two-week Chinese orphanage volunteering program in Phuket, Thailand) as the main methodology. With the observation from the fieldwork, Chinese volunteers from Chinese short-term international orphanage volunteering programs were only one type of the many actors who help to reproduce and participate in the commodification of helping the vulnerable children experience at the care centers. Motivated by or trying to evoke the emotional bond generated from humanitarian imaginary vulnerability of the children, the volunteers, the sending organization, the care center director and the donors presented intimacy (care and love) as the main way to contribute as individual. And by consuming or selling the experience, they each benefited in different ways. The various way to for people to engage in helping experiences, including voluntourism, reflects the essence of the neoliberalisation of development where responsibility of social change is placed on each individual; meanwhile, they help to expand the neoliberalisation of development by transforming new areas into the market.